Gun Orachan began his martial arts studies in 1992 at the age of 14. He first studied Tiger Schulmann’s Karate in Yonkers, New York under Sensei Mekhar, for four and a half years He received his first degree Black Belt in 1997. In 1997, while attending Stony Brook University, he joined the University’s martial arts club. During the next two years he started to train in Northern Shaolin Kung fu, Kenpo Karate, Arnis (filipino empty hand/knife/double rattan fighting system). In 2005, Mr. Orachantara joined the Praying Mantis & Tai Chi Center and since then he has made the study of Northern Praying Mantis Gung Fu system in the early years under Master Pilossoph. In 2007 Mr. Orachantara began studying Yang Style Tai Chi Chuan, Tai Chi Sahn Sao (applications), Toi Sao (sensitivity exercises) and the Tai Chi Gim (sword) from his Master Pilossoph. In Summer of 2010, Mr. Orachantara was fortunate to take part in a Seminar held at his Si Gung’s (Master Tony Chuy) school in NYC Chinatown, by his Si Bak Gung, Master Henry Chung. At this Seminar they learned 7 Star Double Dagger Form “Chut Sing Cern Bay Sao” and Spear VS Empty Hand Form “Chuern Doyee Hung Sao”. Between 2012 to 2014 Mr. Orachantara started competing at the International Chinese Martial Arts Championship (ICMAC), and traveled all over the US to compete in the Adult Chinese Traditional Forms division. He has won over 100 gold medals and became the ICMAC 2013 Grand champion of Traditional Men Division. In 2014, Mr. Orachantara started learning Shaolin Kung Fu and Chen Tai Chuan from Master Cheuk Kwong. He assisted in a creation of Chinese Mix Martial Arts System with his first diciple, Jonathan Rivera, and continues to promote Chinese Martial Arts to future generations. In 2016 Mr. Orachantara wanted to further study the Northern Praying Mantis System. He traveled to the source, and became the 9th Generation Disciple, under Grand Master Yuen Man Kai, Wong Hon Funn Lineage. Along this trip, he was invited by Master Raul Ortiz to join the Newly Found “7 Star World Federation.” He now belongs to the World Brotherhood of the 7 Star Praying Mantis System, sanctioned by Grand Master Lee Kam Wing. After 10 years of diligently training, in 2014 Mr. Orachantara graduated and completely finish the required curriculum to be promoted by his first Sifu, Master Pilossoph, to Sifu Level. In 2016 with the permission of his Master, he and Master Kwong opened the KO Martial Arts Academy, hoping to Unify All Martial Arts Style under one Roof. With various Master teaching under the same roof, offering an intense Basic Foundation Training and then Majoring in ONE particular Style. He wishes that the Academy will flourish, and grow to become a Martial Arts University, similar to Chin Woo, but Globally Unifying all Martial Arts Styles around the World. As Artists, we are born with natural talent to create, to explore paths that are not normal, and be as original as we can be. We create because we are inspired by our emotions. We explore because we are curious of what we can create out of it. To be original is the path that is hardest to follow. An Artist can be very moody, as some may know already. A mood does not always mean that we are angry or sad. The mood I’m referring to is either happy, sad, angry or inspired. As an Artist I tend to create my best work of art when I’m most sad or inspired. In order to create a work of art, there must be something to build upon, whether it’s feelings or another Artist’s work of art. I am like a parasite that feeds off of ideas and turns them into something I feel is now my creation. To be original is one of the hardest paths to follow. How can anybody be completely original? Almost everything has been done. Every means and route you can take to create something original has been walked upon. Nothing is original, because to create something original there has to be a base to start from. How can it be original when it was not created from scratch? There is Art that is original, but there is no complete originality in any Art. There is only evolution in Art. When an Artist creates, it is not original, it is the evolution of another Art. I learned to paint from my teachers and they learned it from their teachers, and so on. Ultimately, it could be traced all the way back to Rembrandt, or Michelangelo, and from there all the way back to the cavemen. This can also be said about martial arts. There are no original style of martial arts. To say that your martial art style is original is like saying you created an original work of art. Every martial art has its roots in something, and it probably all started from the cavemen. That caveman taught it to his son/daughter/family/student and they taught it to theirs, from generation to generation. Every martial art has its base and roots – it has to come from somewhere, from someone who explored and created. Wong Long, the creator of Praying Mantis Kung Fu, created the system based on the 18 best techniques in his time. 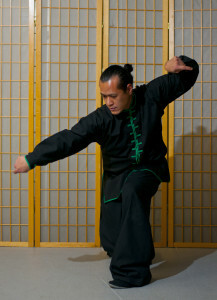 Yang Luchan created Yang Style Tai Chi Chuan based on the Chen Village Martial Arts style. Bruce Lee created Jeet Kune Do based on Wing Chun, in which he added other styles of martial arts that made the most sense to him. Mixed Martial Arts was derived from Jujitsu and Muay Thai. Where did all of these styles come from? Probably from those cavemen. It is the Artist within that person that revolutionizes the style or the painting. It is their own interpretation of the style or the techniques. It is their mind and body that passes it down to their student. We may all learn how to write the same letters A-Z, words, sentences, paragraphs, chapters and books, but how many of us have the same handwriting? How many of us speak with the same tone? How many of us think the same way? It is the soul within us that creates the Art and explores it through our body. The one thing that separates us from other people outside our Kung Fu School is we are all Artists in the Journey of Sifu’s teachings. And someday, it will be our duty to express it the way we feel it, through our own bodies, our own interpretation.